Ashley Rose is a 500 Hour Yoga Alliance Certified teacher and has been practicing yoga for nearly five years. She started practicing purely from a place of fitness and deep stretching because her career as an Emergency Medical Technician would frequently leave her in debilitating pain. On top of the physical demands of EMS, it also rapidly taxed her mind. Quickly, the fitness aspect of yoga faded and began opening doors to staying present, and connection with the self as well as the divine. Ashley’s spiritual curiosity has brought her to places all over the country and to countries that she never dreamed possible, like Israel and India. While visiting Israel, the spiritual dam finally broke free and Ashley’s desire to deepen her practice with herself and others was in full effect. Since Israel (2016) she has studied Chakra balancing, Restorative Yoga, Senior Yoga, basic self treating Herbal Medicine, and more. Ashley loves to work people hard on the mat but knows when to slow it down and melt into the earth. Her classes focus on a strong core, yummy flows, and deep stretches after accumulating a little sweat. If you are a new yogi, fear not! She gives plenty of modifications using bolsters, blocks, straps, and blankets. A little bit about her trainings: Ashley received her 200 Hour Hot Warrior Yoga certification with Jennilee Toner in 2015. She also attended Hot Vinyasa Teacher Training (Level 2 + 3) with Jimmy Barkan in 2015, and recently spent a month in India with Raghunath Cappo at the Govardharn Eco Village. 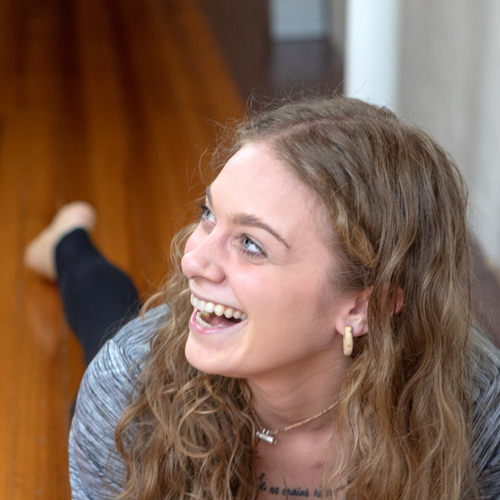 After her recent trip to India, which was a completely transformative experience, Ashley defines herself as a new and practicing Bhakta, inspired by her traditional Judean roots. Come chant, breathe, sweat and, most importantly, love yourself and learn to be humble with where you are in your practice.